Born and raised in the South, I’ve been through my fair share of crazy weather. Tornadoes, hurricanes, floods, you name it, and I can tell you the Twitter hashtags and safety procedures that go with them. Basements, for example–as soon as you know there’s a tornado coming, you head to the lowest part of whatever building you’re in, and you avoid windows. If you don’t have a basement, a bathtub is a good second choice. 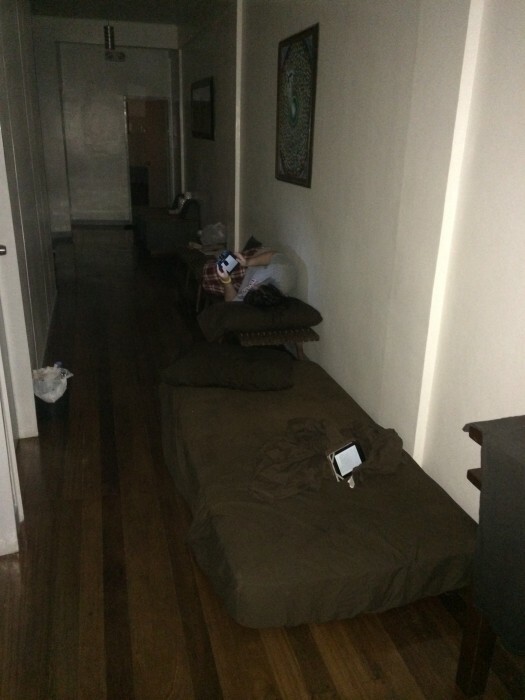 If you live in an upstairs apartment, you hope and pray that your downstairs neighbors are home and willing to let you hang out with them until the storm passes. So what do you do when you’re in the middle of a typhoon in a coastal village in the Philippines? Apparently, if you’re me, you pull your mattress into the hallway, play UNO by candlelight, and serenade the other residents with Disney songs. But I’m getting ahead of myself. Last month, my classmates and I took a trip to the Philippines to study the impacts of climate change on food security and nutrition in a rural, coastal area of the country. This trip was part of Integrated Community Development (ICD), a core class for our global health program. At the beginning of the ‘13-’14 school year, we had a choice between going to Peru or the Philippines, and from there we had a choice of two projects to work on. There were 10 students in the Philippines, and we split into two groups for our projects. 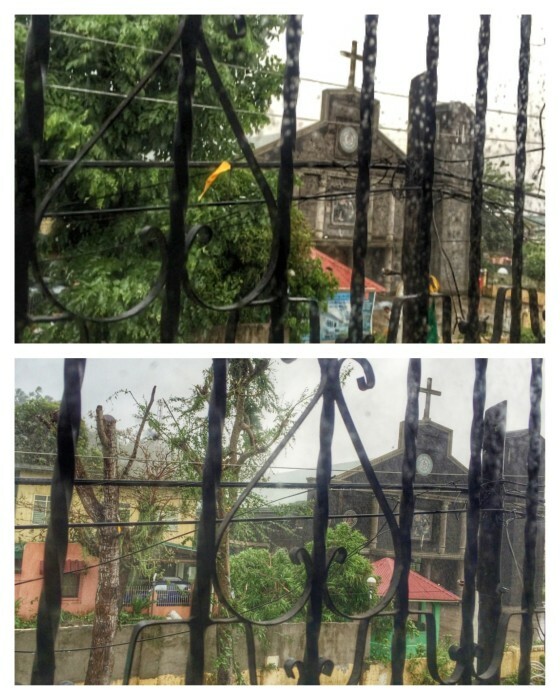 “You go during typhoon season, but we’ve never had a problem before,” our professors assured us throughout the year. This was especially applicable to the region where we were doing our study, which hadn’t been affected by a typhoon in five years. We weren’t worried. Our first week was spent at the International Institute for Rural Reconstruction (IIRR) headquarters in Silang, Cavite, about an hour and a half south of Manila. That week, we attended lectures pertaining to our projects and toured local governmental and non-governmental organizations such as the Department of Health and Save the Children, respectively. At the end of the first week, our group of five students plus our instructor headed out to Quezon, a province a few hours away from Cavite. We had tea with the governor (where he also invited us to dinner in a floating hut--amazing), toured a couple of the towns, and began our research. Our first full day of research consisted of key informant interviews, a focus group discussion, and case studies in the community in which we were staying for the week. We asked questions linking climate change, food security, and nutrition, and we got to know the personality of the community. Something my classmates and I noticed right off the bat was the warm and generous nature of the people there. 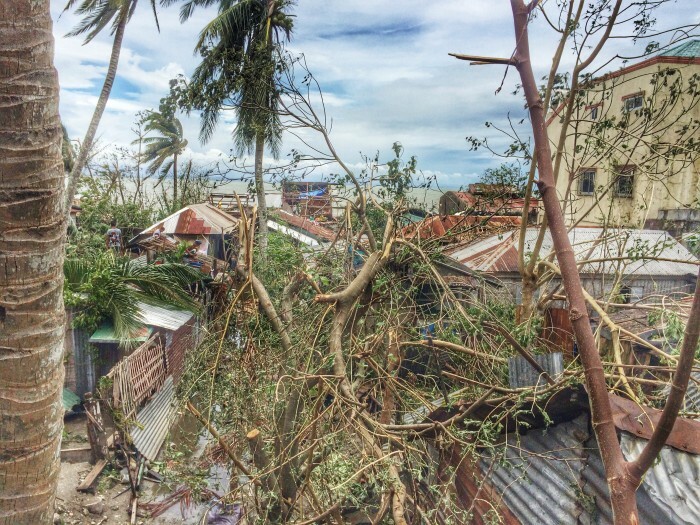 Throughout our first day of research, we were told about the potential of an upcoming typhoon–known as Glenda in the Philippines and Rammasun internationally–and were advised to stay in our house. The rain was heavy and the power flickered, but the typhoon ended up slowing down and hitting the next evening. The next day we spent milling about the house, reading, and modifying our research questions. 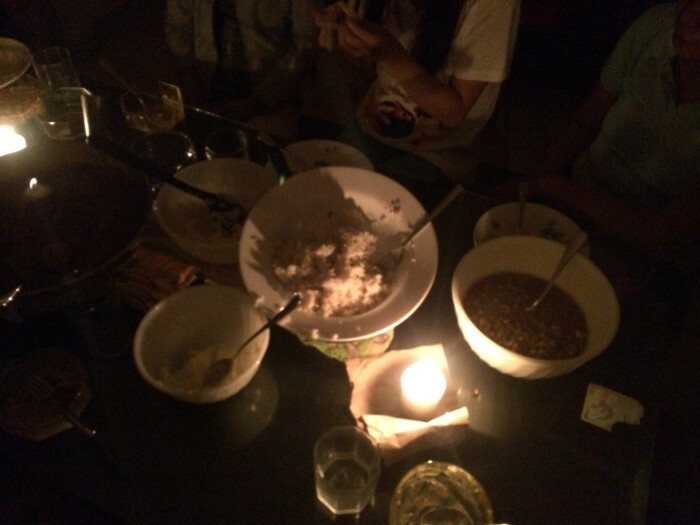 We cooked a delicious family-style dinner by candlelight that evening, and later that night, the typhoon hit. It was around 7:00 pm when we noticed the howling of the wind (which, according to our IIRR partner, Maggie, meant the typhoon was there). Soon after, the debris began clattering and clanging against the sides of the house, and the walls began shaking like a small earthquake was hitting. This continued on for several hours, and intensified with time. At one point, we noticed that the door in one of the bedrooms was actually leaking water–not just around the hinges, but through the middle of the door, and debris was getting washed in as well. clanging and clattering of the various roof tiles, branches, and other debris hitting the sides of the house. We then spontaneously started singing Disney songs which was surprisingly peaceful and also took us on a short trip down Memory Lane. Our instructor, Helen, came upstairs to let us know there were about 30 people downstairs taking refuge from the storm, and that they were enjoying the music, so we kept it up for a little while longer. I’m not sure how singing falls under the category of disaster relief, but I think this should be an area of future research. After a few rounds of music and “would you rather” (i.e. would you rather fight a horse-sized duck or a thousand duck-sized horses? ), I was the first to head to bed. I dragged my mattress back into my room, and at this point it was around three in the morning. I had to sleep with headphones to drown out the sounds of the storm outside. split into two groups for relief work (unfortunately, none of which involved Disney songs). One group helped debris clean-up in the streets, and the other group helped pass out provisions. We immediately noticed several things about the community post-disaster. The immediate quality we all noticed was the resilience of the community. They didn’t wait around for assistance or aid. They did what they had to do, cleaned the area, and got back to business as usual, to the best of their ability (last we knew, it could take up to six months for electricity to be completely restored in the region). They were friendly and welcomed what help we could offer, but they certainly weren’t relying on it. Another thing we noticed was how involved the political leaders of the area are. The mayor and vice mayor were up early to personally survey the damage and to figure out a plan of action. There weren’t cameras, there weren’t news stations following their every move, and there wasn’t an upcoming election for which to campaign. They were simply doing their jobs, and doing them to the best of their abilities. Throughout the entirety of our trip, we noticed that Filipinos are extraordinarily warm and welcoming. This was especially evident after the typhoon hit. The owners of the house we were staying in went above and beyond to make sure that we had a good place to stay both before and after the storm, despite the issues with running water and electricity. They owned a pharmacy/convenience store next to the house and would regularly bring us snacks, and refused to let us pay. This is just a small example of their overwhelming benevolence. As mentioned previously, I’ve been through storms before, but I had the luxury of living in a high-income country while weathering those storms. To experience a storm of any magnitude can be scary, but doing so in a low-income country puts a whole new spin on things. Knowing what I know now, I wouldn’t change my experience. I would most definitely do it again. It was terrifying, yes, but it was also an incredible learning experience. Learning how to work and live with others in the midst of what could be considered a crisis is an invaluable experience. I think the most important takeaway of this experience is learning to surround myself with good people. This is critical. My colleagues, our instructor, our project partner, and the community were all phenomenal, and I say that in the most literal sense of the word. We worked well together and supported each other, and that made all the difference in this adventure. What a great post! I enjoyed reading about your adventures (misadventures?) and experiences in the Phillipines. You have a great voice for story telling. The ICD trip sounds like an amazing opportunity for study and cultural exploration. It is heart-warming to read about the silver linings your found amid disaster. Thank you for sharing!